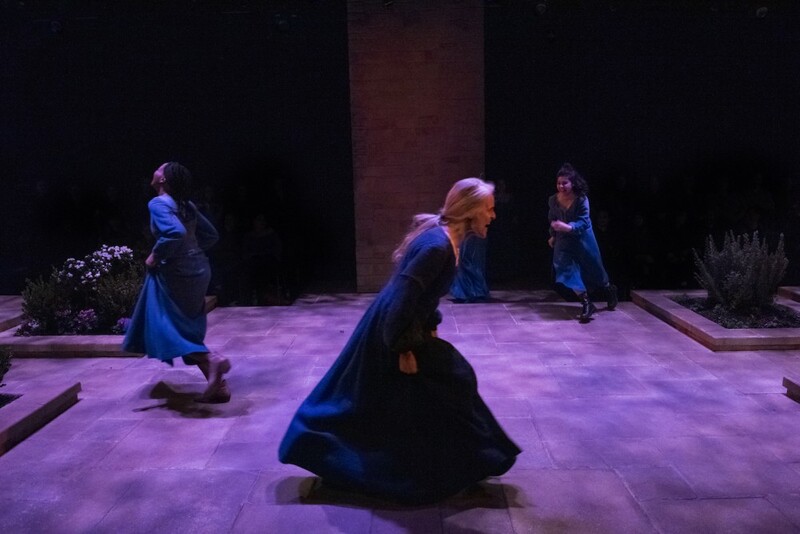 Given the sturm and drang of what goes on there, it’s a wonder anyone would want to return to the medieval convent that forms the heart of Jessica Dickey’s overwrought, overacted feminist play The Convent, now at A.R.T./New York Theatres. The retreat offers a mix of feminist uplift and group therapy for troubled women seeking spiritual enlightenment and self-empowerment. Here women immerse themselves in a medieval atmosphere of self-sufficiency (cleaning, food gathering, etc. ), absent cell phones and other connections to the outside world. Everyone dresses in faded, green, medieval-like gowns (costumes by Tristan Raines), with prayers held at traditional nunnery times, including “Lauds” at 3 A.M.
Each visitor draws from a pack a Nomen card, associating her with a medieval mystic on whom she must do research and attempt, as an exercise in self-awareness, to identify herself. These include Julian of Norwich, Teresa of Avila, and so on. Dinners are marked by prayer sessions in which the women share background on what they’ve learned, along with reciting their personal desires. Hallucinogens also play a role in bringing the women closer to their mystical goals. This is all connected to the pronouncements of the Mother Abbess about women finding their inner light, much of it sounding like New Age mumbo-jumbo: “A woman can only follow herself. Which means a woman must lead herself. Which means a woman must always strive to be both—the one who is following, and the one who is leading.” And worse. The most pertinent comments on women’s need for independence from men comes from the lesbian Patti, although she shoulders such a big chip it’s a wonder why anyone would listen. 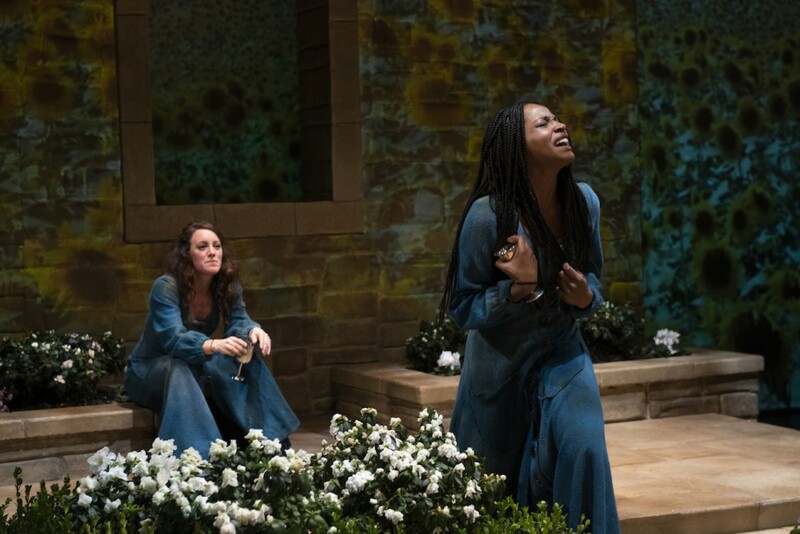 Patti, for reasons that eventually become clear, challenges the Mother Abbess, creating turmoil and helping bring the play to its climax in a melodramatic plot development that only emphasizes how artificial everything preceding it is. While the idea of women seeking spiritual and even psychological guidance in a retreat can, under the right circumstances, be valuable, what we see here never convinces us that there’s much to gain at this particular place by these particular women from this particular leader, whose own failings will gradually come into focus. Moreover, none of the largely uninteresting characters—the others being Jill (Margaret Odette), a married African-American woman; Tina (Brittany Anikka Liu), a childish stoner; and Wilma (Lisa Ramirez), a middle-aged nun having a crisis of faith—are in the least credible. What plot there is—before the big reveal—concerns the women’s interrelationships, much of it about their sexuality, straight and gay (with lots of smooching), and much of it tense. I suspect there’s a stockpile of throat lozenges and spray backstage to soothe the actors’ voices, so loud are their screaming matches, especially those of vanden Heuvel and Soule. Convents are usually thought of as places of silence and contemplation but, as energetically directed by Daniel Talbott, who also interjects moments of ecstatic dancing (accompanied by Erin Bednarz’s first-class sound design), this one is filled with so much yelling it might as well be situated in the subway as on a hilltop. The final scene is indeed placed in a subway station, where, for her Olympic-level shouting, vanden Heuvel deserves a gold medal. Dickey tries to bring the play’s preoccupation with high-flying spiritual themes down to earth by adding vulgarities every few lines, as if the more f-bombs a day the more you can keep the blues away. Even the Mother Abbess throws the word around freely. But the mix of pseudo-poetic dialogue, earthly obsessions, and gutter language rings false. 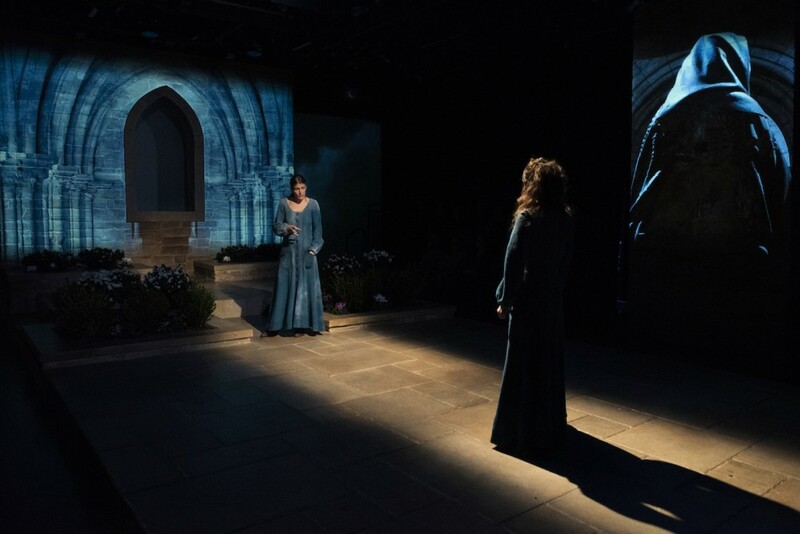 What works in The Convent are its technical and design elements, not least of which is Raul Abrego’s set, beautifully illuminated by Joel Moritz, which places the audience in two or three rows on either side of a lovely convent garden; at each end is a church-like wall. On these walls and elsewhere, Katherine Freer’s projections show medieval religious art, exterior landscapes (but why waving, Kansas-like fields of wheat (?) on a hilltop? ), and various abstractions. Even the subway thus rushes to vivid life. 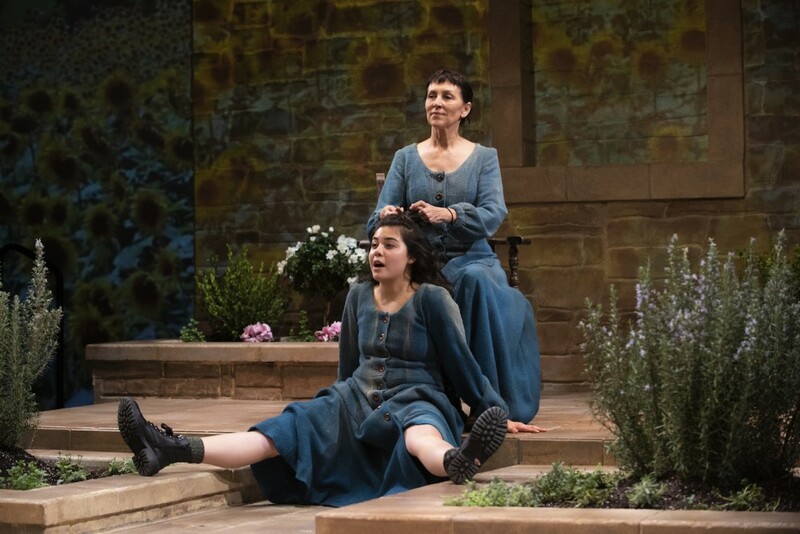 The Convent, a coproduction of Weathervane Productions, Rising Phoenix Repertory, and Rattlestick Playwrights Theater, invites retreat, but not the kind its characters are seeking.